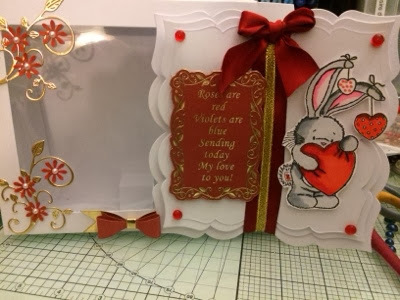 Well today after a card class I decided to make a valentine's day card. I am not too sure if this should be for my husband as yet. The card and the box is called open book card set. It contains 3 open book card sets and 3 wedge boxes with acetate. Which is available to buy from Cara Jayney who is on Facebook which is Kathy Mill's daughter. 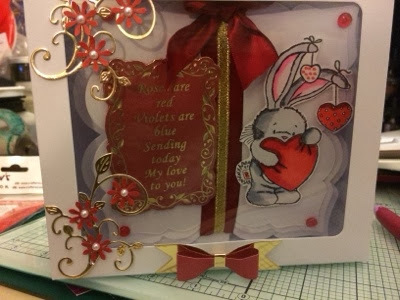 The sentiment on the one page is see through and I placed it onto red pearlised card and I cut around the peel off and used foam pads to raise it. The image I used is from the bebunni rubber stamp range called hearts and coloured with the 2nd generation spectrum noir pens which are available from www.crafterscompanion.co.uk. The red and gold ribbon are from my old stash. Oh this is gorgeous Sam! Hi Sam, a gorgeous card and love the colours. This is so beautiful - great project! this is very beautiful Sam.